Definition at line 114 of file unsolicited-data-policy.hpp. Definition at line 94 of file unsolicited-data-policy.cpp. 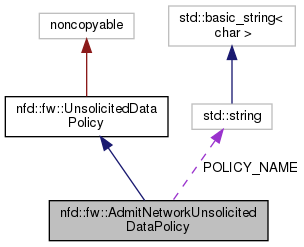 References nfd::fw::CACHE, nfd::fw::DROP, ndn::nfd::FACE_SCOPE_NON_LOCAL, and nfd::face::Face::getScope(). Definition at line 121 of file unsolicited-data-policy.hpp.